These meringues elevate classic Oreo cookies- transforming them into chewy and light deliciousness. With minimal ingredients, the recipe is beyond simple too. This recipe was adapted from a Food 52 “Community Pick” recipe. I used a cookie scoop to ration the dough. Crush the Oreos in a food processor into fine crumbs. Reserve 1/4 cup of the crumbs for the topping. In a large bowl or stand mixer, whisk the egg whites and salt until light and foamy. Gradually add the sugar, spoonful by spoonful, until you’ve got firm peaks—bright, white, and shiny. Gently fold in the Oreo crumbs, (keeping 1/4 cup reserved) just barely- so you have ribbons of “cookie” amidst the “cream”. Scoop (with an ice cream scoop) balls of the meringue mixture onto a sheet pan lined with parchment paper, then sprinkle the leftover Oreo crumbs on top unevenly, messily. Bake at 275°F for 45 minutes to 1 hour until dried out but not totally crisp. These meringues should be like chewy cookies ‘n’ cream clouds when you bite into them. 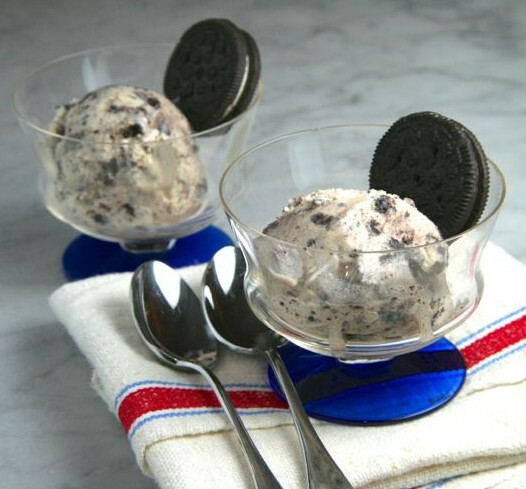 I shared this ice cream base recipe with a friend early in the summer – of course with plans to try it soon myself. When she raved about the strawberry and chocolate versions that she had made, I had to move it to the top of my “to make” list! In a small pot, simmer heavy cream, milk, sugar and salt until sugar completely dissolves, about 5 minutes. Remove pot from heat. Meanwhile, place cookies in a gallon-size zip-lock bag. Crush with a mallet until pieces are desired size. Churn in an ice cream machine according to manufacturers’ instructions. At the end of churning, add crushed cookies to the machine. Serve directly from the machine for soft serve, or store in freezer until firm, about 4 hours.